Precast prestressed concrete enjoys wide use in all types of residential, commercial and Industrial structures; particularly multiple unit residential, office buildings, hotels, nursing homes, retirement homes, institutions, manufacturing, storage or treatment facilities, where the repetitive use of standard components manufactured in a factory can be fully utilized. The significant benefits of superior fire resistance, sound control, durability and low maintenance, owners and designers alike recognize rapid construction and attractive exterior treatments. The most common floor and roof elements employed for shorter spans are 205 mm deep untopped hollow-core plank. These slabs can span up to 9 m or more without intermediate supports. Longer spans can be achieved by using 254 mm or 305 mm deep hollow-core units. Consider double tees for those longer spans and heavier loads that exceed the capacity of hollowcore plank. Spans can range from 10 to 25m for floor loads to over 33m for roofs. For both Double Tees and hollow-core plank they can be oriented to either span between load bearing shear walls or to span from the central bearing wall or beam and column assembly to an exterior wall. Bearing walls may be of masonry, precast concrete or cast-in-place construction. 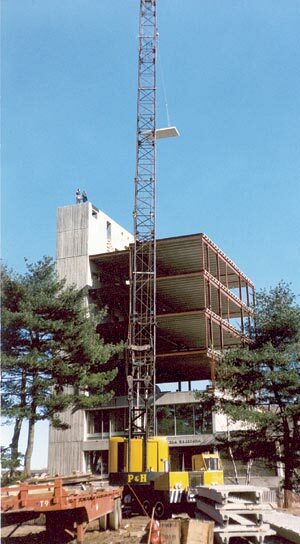 The use of precast walls speeds the erection process. Construction rates of 1 floors per week and better are often achieved. Architectural insulated panels for the exterior of a building can provide a durable, attractive, energy efficient envelope. Ancillary recreation, parking and convention facilities are commonly constructed using precast concrete framing with long span roof and floor members.